When Americans dine out we typically want to have a special experience, indulging in food and drink that we wouldn’t enjoy at home. We’ll order a pricey bottle of a mighty cab that we might never buy at the wine store or we might order a chocolate soufflé knowing full well that we’ll never make such a dessert in our own kitchen. And so it makes sense that many of us find the concept of purified—instead of bottled water—difficult to swallow. While a growing number of restaurants across the country are beginning to serve purified water, eschewing the bottled stuff that eats up massive amounts of fossil fuel getting here from exotic spots such as Italy or Fiji, many Americans continue to be hoodwinked by the perceived status and purity of bottled water, oftentimes leaving facts and the health of the environment to swirl down the drain. In Chicago, green restaurateur Shawn McClain and his trio of restaurants, including Green Zebra and its exquisite vegetarian dishes and Spring’s evolved fare, stopped stocking bottled water and began offering Natura, an Italian based water purification system. While Natura’s process improves the flavor and purity of water, many diners scoff at paying extra for H20 that doesn’t come in a disposable bottle—regardless of whether it tastes any better or is more pure. But the fact is that the purifier and others like it often creates water that’s more pure and refreshing than that found in a sealed bottle. Natura’s system involves active carbon filters and a UV radiation chamber which remove bacteria and eliminates impurities and offers the final refreshing dose of water in a dishwasher safe, reusable bottle. 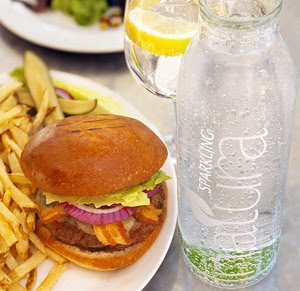 In essence, diners get the look and feel of bottled water without the environmental cost. And there’s plenty of research sprinkled across the Internet that shows that tap water bests many bottled waters when it comes to flavor and quality—even New York City tap water. It’s a given that our bottled water habit is wreaking environmental devastation. Walk along a city street—or a beach nearly anywhere—and you’re likely to see an improperly disposed bottle of water washing ashore. And the bottle you’re likely to see is merely one of billions per year that we Americans empty and toss aside in a year. Worldwide some 2.7 million tons of plastic are used to bottle water each year, and much of this ends up in landfills, sluicing along inland waterways, rolling across intersections or bobbing in the Texas-sized island of misfit plastic waste bobbing in the middle of the Pacific Ocean. Ordering locally produced and purified water makes perfect green sense. In fact, if we’re more serious about addressing the critical environmental issues raised by our consumption of bottled water, we would be willing to pay extra for such water, much as we do for organic produce. Ordering purified water in restaurants is a good first step toward breaking the bottled water habit, demonstrating that it’s neither trendy nor smart to order bottled water.